For the past 30 years, Coldwell Banker Town & Country Realty of Kearney has been highly respected in our community by offering professional service to all of our clients. We specialize in single family homes, condos, lots/acreage farms, commercial property & business opportunities. We have 23 licensed agents that are knowledgeable in all aspects of real estate, a full time Office Manager & a full time Closing Officer. You can find our For Sale signs all over Buffalo County and the surrounding areas. 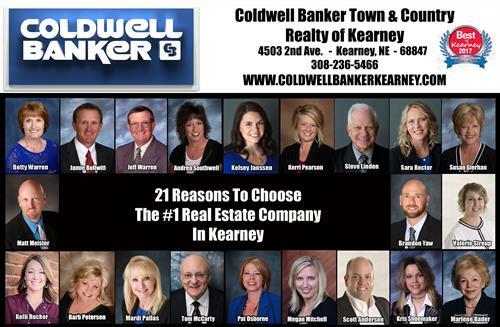 We are honored to be voted Best of Kearney Reader's Choice Award in Real Estate for the past several years.